Scenic Black Lake is a natural lake formed by the same glacier that carved out the Great Lakes and is one of the most famous fishing spots in New York State. Black Lake covers an area of nearly 11,000 acres among enormous rock formations and is over 20 miles long and around 4 miles across at its widest point. Areas of Black Lake are filled with many sandbars, underwater shoals, and majestic rocky islands similar to those in rugged northern Canada. The Indian River and Fish Creek are the primary feed waters for Black Lake and the water outflows over 20 miles to the north and empties into the Oswegatchie River, where it flows over the Eel Weir Dam and ultimately joins the St. Lawrence River at Ogdensburg. Black Lake weather offers mild days (it's rarely hot on the water) and cool evenings. And generally it's so secluded that the only competition for fish comes from the Great Blue Herons! Speaking of monster fish, a good fishing fight awaits in the Black Lake backwaters where 3-4 foot garpike and 20-pound catfish lurk. 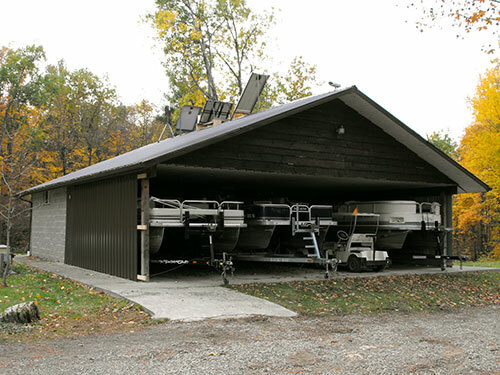 Back Bay Campground & Cottages features its own "fleet" of boats available for rent by our guests. 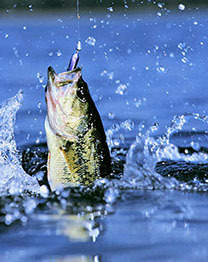 Whether you want to go fishing or just spend a relaxing day on Black Lake, you'll enjoy the convenience of our reasonably priced boat rentals!